From Dry and Mild to Wet and Wild . . .
Kayaking on the Noyo River Gets a Thumbs UP! 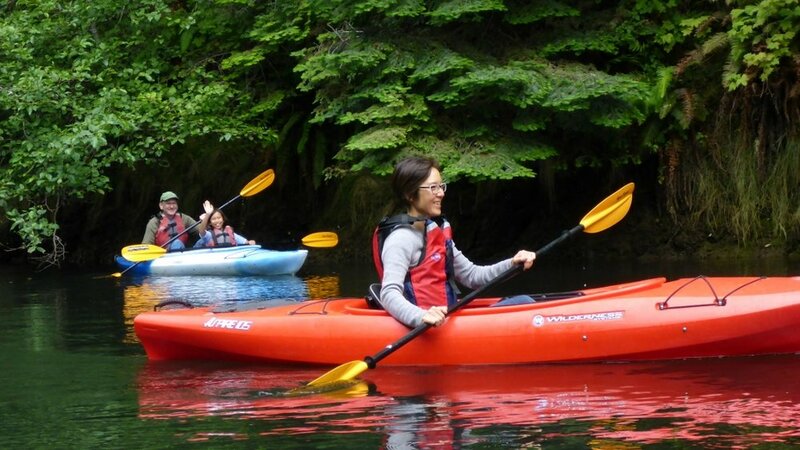 Explore the placid Noyo River Estuary or kayak and play in the rock gardens and sea caves of the Mendocino Coast. You will be intrigued by wildlife and inspired by rugged beauty. Experience more than a tour - engage in an interactive and educational adventure. With small group sizes, Liquid Fusion Kayaking's expert guides are at your side - enhancing the experience and sharing secrets of the wildlife and history of the Mendocino Coast that only locals know. Adventures for all ages and abilities. No experience necessary. Learn kayak skills to explore more places and have more fun. The Mendocino Coast is a beautiful and fun place to learn kayaking skills. We teach sea, river, and surf kayaking for beginning through advanced paddlers. Do you need some guidance on which class is right for you? Email or call us. Classes, private lessons, and assessments are available. Let us share the magic of kayaking with you and your family and friends. We created Liquid Fusion Kayaking to share our love of the outdoors with others. Liquid Fusion Kayaking is an owner-operated instructional kayak company on the Mendocino Coast of California. All tours and classes are led by us. You get the "A" Team for each class or paddle. Don't take our word for it - Read what others are saying about us.